This building is chiefly known as a romantic folly supposedly reproducing a small medieval Welsh chieftain's stronghold, built in the 1870s, for the 3rd Marquess of Bute to a design by William Burges, and possessing the most remarkable interior decoration. However, it was built upon the remains of a genuine 13th century castle built in two stages. Evidence was found of the building having been deliberately slighted by mining. 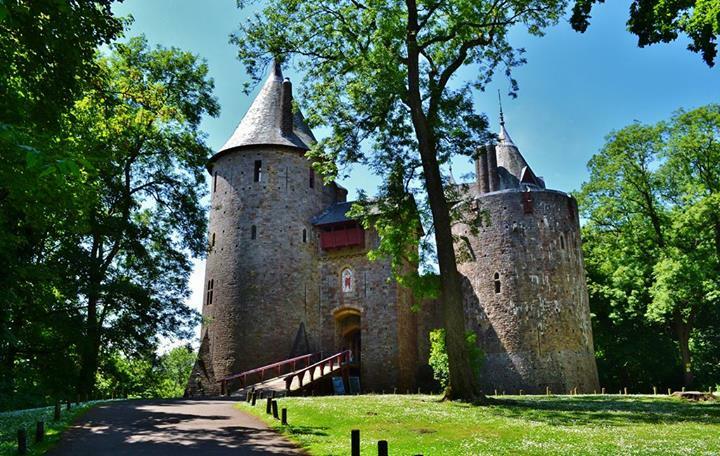 The castle was probably founded by a Welsh lord in c1240-65 and had a round tower keep at the SW corner of a tiny D-shaped courtyard with a hall on the south side, all built of rough rubble sandstone from which the building took the name Castell Coch, or "Red Castle." It stands upon a platform commanding the gorge of the Taff and was protected towards the higher ground by a deep dry moat from the bottom of which the walls rise with a very broadly battered base. The keep contained vaulted rooms, and probably had a fourth storey and a conical roof like it has now. The walls are over 3.3m thick above the square battered base from which it rises with pyramidal spurs.